My mother has been growing lavender for a couple years, brought to us by her friend with the green thumb. 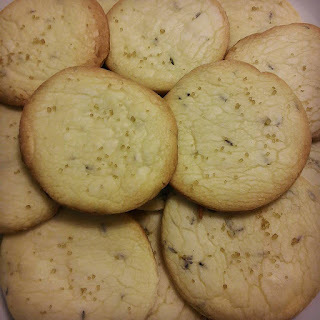 I've been eyeing them for shortbread cookies for some time. Lavender is often paired with sweets for a savory-sweet culinary blend. These are a delicious, buttery blend of yummy goodness. 1/2 cup powdered sugar, and a bit more. In a large mixing bowl, cream together everything until crumbly dough forms. Powder the surface with more powdered sugar. Knead like crazy until soft, pliable dough forms. Roll 1/4 inch thick and cut. Finish with a dusting of granulated or decorative sugar. I used turbinado. Bake 15-20 min, until lightly golden. Makes 16 cookies at 180 calories each.